The day auctions of Impressionist & Modern Art are usually filled with a lot of "pretty" but unimportant paintings and drawings and sculptures but there inevitably are some very fine works that could very well have been included in the more limited and more expensive evening sales, and indeed this time there are probably more fine works, despite their generally smaller size, than in the evening auction. 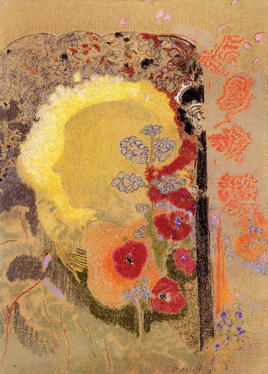 One such example at this day auction at Sotheby's is Lot 139, "Tete Visionaire," by Odilon Redon (1840-1916), shown above. The 24 5/8-by-18 3/8-inch pastel on paper was executed circa 1907 and has an estimate of $250,000 to $350,000. It is very sumptuous and typical of the artist's meditative portaits of woman surrounded by flowers and plants. Redon's mystical and lyrical works are fairly rare. It failed to sell. 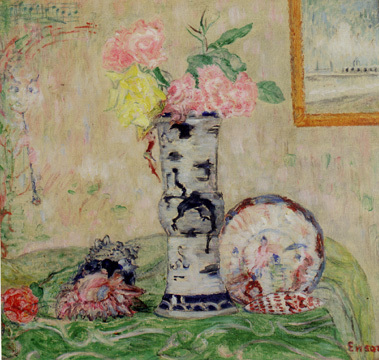 James Ensor (1860-1946) is another eccentric individualist whose works do not appear at auction often. Lot 141, "Une symphonie Musicale (Vision Claire)," shown above, is a 14 3/4-by-16-inch oil on canvas that was executed in 1928. Ensor is best known for his depictions of masks and generally his compositions are rather foreboding although bright. This attractive still life has a conservative estimate of $40,000 to $60,000. It sold for $84,000 including the buyer's premium as do all the results mentioned in this article. 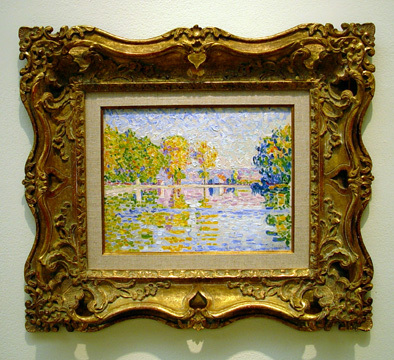 Paul Signac (1863-1935) is a very vibrant Pointilist painter whose oeuvre was the subject of a recent retrospective at the Metropolitan Museum of Art. Lot 143, "Samois, Etude No. 10," shown above, is an oil on canvas board that measures 10 5/8 by 13 5/8 inches. Painted in 1899, it has an estimate of $150,000 to $200,000. It sold for $288,000. While Lot 143 is fairly loose in its painterliness, another Signac, Lot 147, "Marseille, Le Vieux Port," is quite wild and exciting in its handling of paint, almost foreshadowing de Kooning. An oil on canvas board that measures 10 5/8 by 13 3/4 inches, it was painted in 1906 and has an estimate of $50,000 to $70,000. It sold for $125,600. Lot 145, "Les Barques au Clair de Lune, Le Treport," is a very interesting work by Henri Le Sidaner (1862-1939). The 21 3/8-by-29-inch pastel on canvas is a Whistlerian nocture of boats on a body of water. It has an estimate of $40,000 to $60,000. It sold for $48,000. 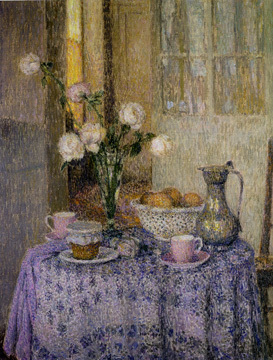 A larger, more typical work by Le Sidanier is Lot 157, "La Table Dans L'Interieur," an oil, pen and ink on canvas that measures 36 1/4 by 29 inches. Executed in 1928, it is the frontispiece of the catalogue and illustrates the artist's muted palette and keen sense of composition. It has an estimate of $400,000 to $600,000. It failed to sell. Sidanier ranks with Henri Martin (1860-1943) and Gustave Loiseau (1865-1935) in the ranks of the second generation of French Impressionists. Lot 155, "Berger Jouant du Pipeau au Coucher de Soleil," is a quite striking work by Martin because of its quite dazzling sunset. The oil on canvas measures 28 3/4 by 38 1/2 inches and was painted circa 1895. It has an estimate of $60,000 to $80,000. It failed to sell. Lot 171, "Bords de Riviere, Normandie," is a very strongly impressionistic oil on canvas by Loiseau. It measures 26 by 32 inches and was executed in 1918. It has an estimate of $60,000 to $80,000. It sold for $90,000. Lot 186, "Le Poet Alberto Lozano," is a charming charcoal and pastel on paper, 8 5/8 by 5 5/8 inches by Pablo Picasso (1881-1973). The work was executed in 1901 and has an estimate of $80,000 to $120,000. It sold for $164,800. One of the finest works in this auction is Lot 188, "Study for the 'Skating Rink' Curtain," a watercolor on board by Fernand Léger (1881-1955). The 14 7/8-by-17 3/4-inch work was executed in 1921 and has an estimate of $200,000 to $300,000. 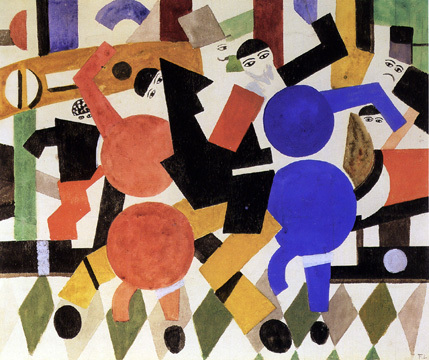 Léger was invited by Fokine and Rolf de Maré to design the sets for two productions, La Creation du Monde and Skating Rink, for their Ballet Suédois when it went to Paris. This is a fabulous design. It failed to sell. Lot 196 is a very fine sculpture by Alexander Archipenko (1887-1964). Entitled "Statue on Triangular Base (Statuette), bronze, 30 1/4 inches high. Conceived in 1914, it was cast in an edition of six circa 1955-7. It has an estimate of $200,000 to $300,000. It failed to sell. Lot 199A, "Composition with Three Circles," is a very fine drawing by Laslo Moholy-Nagy (1895-1946). The pen and brush and ink, pencil and colored crayon on paper measures 16 3/4 by 13 3/4 inches. It was drawn in 1946 and has a conservative estimate of $5,000 to $7,000. It sold for $13,200. A fine companion piece for Lot 199A is Lot 205, "Warmes (Warm)," by Wassily Kandinsky (1866-1944). It is a 14 1/2-by-9 7/8-inch watercolor on paper that was executed in 1924 and has an estimate of $180,000 to $220,000. It failed to sell. One of the most beautiful works in the auction is Lot 206, "Dame im Breiten Hut (Lady in a Wide-Brimmed Hat," by Paul Klee (1879-1940). A watercolor and oil on paper mounted on board, it measures 10 3./8 by 15 1/2 inches. Executed in 1931, it has a modest estimate of $60,000 to $80,000. It sold for $90,000. 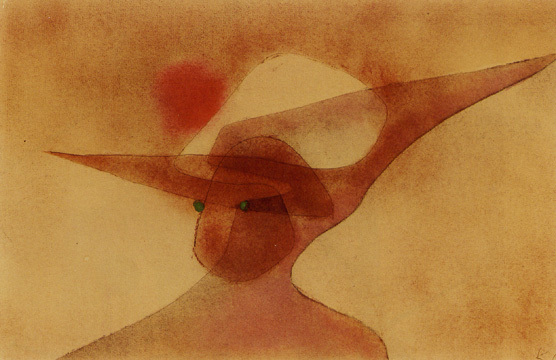 Another excellent work by Klee is Lot 219, "Auferstehende (Resurrection)." A casein, gouache and pencil on prepared paper, it measures 10 1/2 by 8 1/8 inches and was executed in 1938. It is a very beautiful and bright abstract composition in yellow, white and pale blue. It has a conservative estimate of $80,000 to $120,000. It failed to sell. 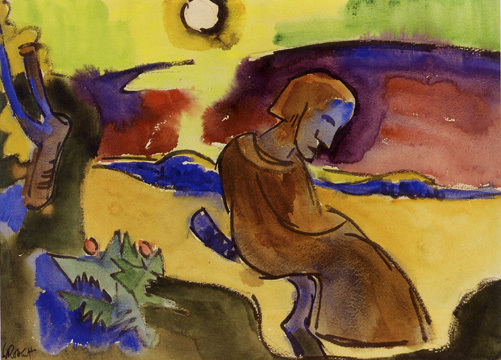 Works by Karl Schmidt-Rottluff (1884-1976) do not appear at auction often and Lot 209 is a very striking watercolor by him entitled "Landscaft mit Sitzender Figur (Landscape with Seated Figure." The 19 3/4-by 27-inch work was once in the collection of Dr. G. Wilhelm R. Valentiner, a former director of the Los Angles County Museum and the Detroit Institute of Art and the author of a monograph on this artist. It has a modest estimate of $80,000 to $120,000. It failed to sell. 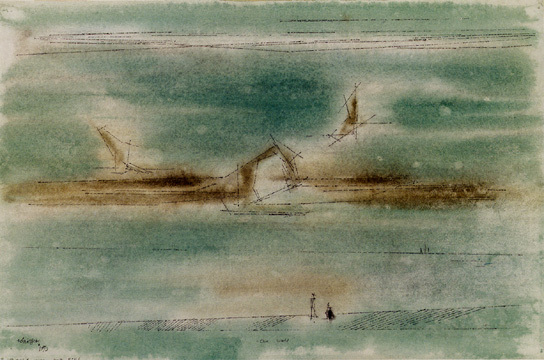 Lot 218 is a classically lyrical work by Lyonel Feininger that is entitled "One World." The watercolor and pen and India ink on paper measures 12 1/2 by 19 inches. Executed in 1953, it has a conservative estimate of $8,000 to $12,000. It sold for $16,800. 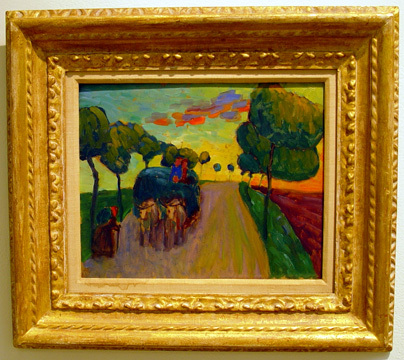 The auction has a group of works consigned by the estate of actor Rod Steiger, the most notable of which is Lot 222, "Entwurf Heuwagen (Study of a Haywagon)" by Gabriele Münter (1877-1962). The oil on board measures 13 by 16 inches and was painted in 1908. The catalogue notes that Münter traveled with Wassily Kandinsky in 1908 in the Bavarian countryside and they chose Murnau on the Staffelsee Lake and were soon joined by Marianne von Werefkin and Alexej Jawlensky, the Russian artists. The powerful small painting has an estimate of $150,000 to $200,000. It sold for $232,000. 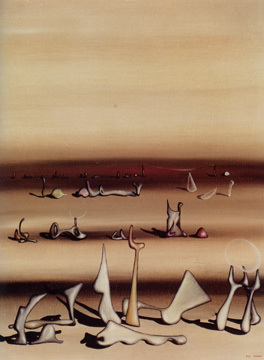 Yves Tanguy (1900-1955) is one of the most abstract and inventive of the Surrealists and Lot 312, "L'Extinction des Especes," is a fine example of his artisty. An oil on canvas board that measures 13 3/4 by 10 1/2 inches, it is dated 1936 and has an estimate of $150,000 to $200,000. It is the cover illustration of the catalogue. It sold for $288,000. Lot 338 is an impressive bronze sculpture by Henry Moore (1898-1986) that is a "Working Model for Mother and Child:Hood," a sculpture he did for St. Paul's Cathedral in London. This sculpture is numbered 1 of 9 and was executed in 1982. It has an estimate of $350,000 to $450,000. It failed to sell. Another fine sculpture is Lot 341, "Figure," by Barbara Hepworth (1903-1975). The 72-inch-high bronze is number 6 of 6 and was executed in 1964. It has an estimate of $200,000 to $300,000. It sold for $377,600. About 72 percent of the offered lots sold, about the same percentage as the night before at Sotheby's evening Impressionist & Modern Art auction.